Summer’s a great time for togetherness. So bring the whole family together to enjoy each other’s company, as well as fun activities, tasty snacks, and plenty of laughs. Set up beach towels (and inflatable palm trees, if you want). Watch a Hawaiian movie (we think Elvis made a few). Campout in the Yard – Skip the long drive, avoid the bears and poison ivy, and just go camping out under the stars right in your own backyard. Set up a tent and roll out the sleeping bags. If your city permits, have a small bonfire and roast marshmallows. Tell funny or scary stories. Stay up way too late. Minute to Win It Game Night – You can play your favorite board games, or you can have lightning round family competitions with these quick, simple challenge games. Move M&Ms from one plate to another using only a straw. Try moving a cookie from your cheek to your mouth—without using your hands. Pick up marshmallows with chopsticks and place them in a bowl. Stack 25 pennies using only one hand. Hold a popsicle stick in your mouth and see who can stack and balance the most dice on the end of it. Pizza Party – Everybody loves a good slice of pie—especially pizza pie! Younger kids love choosing toppings and putting them on the pizza. 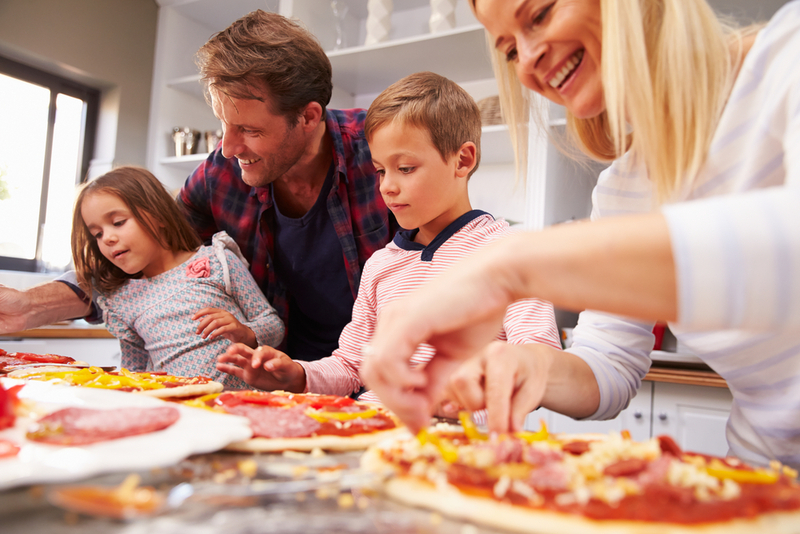 Older kids can help measure ingredients and even cut up some toppings. Make a kid pizza and an adult pizza, so you can try different flavor combinations. Or find a recipe for dessert pizza, for a whole pie-themed night! Can’t decide what to do tonight? Take these suggestions (and any of your own), write them on popsicle sticks, and put them in a jar. Take turns selecting sticks to find out what you’ll be doing on your own family fun night!